The recent double-counting dispute isn’t just about politics; it also reveals a flaw in budgeting for Medicare Part A. Budget experts are waging a spirited battle over the Medicare changes that helped pay for 2010’s health reform. In April, Chuck Blahous, one of two public trustees of the program, released a study arguing that the Affordable Care Act (ACA) would increase the deficit by at least $340 billion by 2021, a sharp contrast from the $210 billion in deficit reduction estimated by the Congressional Budget Office (CBO). Chuck bases his estimates on several factors, but the item that has garnered the most attention is his charge that the ACA’s spending cuts and revenue increases in Medicare Part A are being double counted: once to help pay for the ACA’s coverage expansion and a second time to improve the finances of the Part A trust fund, whose predicted exhaustion was delayed by several years. Chuck notes that those resources can be used only once: They can either offset some costs of health reform or strengthen Medicare, but not both. He believes those resources will ultimately finance additional Medicare spending and thus can’t offset any health reform costs. For that reason, he concludes that the ACA would increase deficits, rather than reduce them. 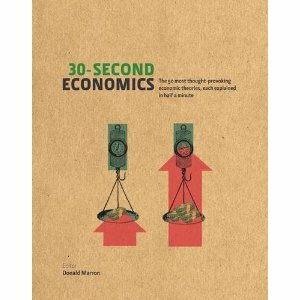 That argument inspired a host of commentary from leading budget experts, ranging from denunciation to affirmation. See, for example, Jeffrey Brown, Howard Gleckman, Peter Orszag, Robert Reischauer (as quoted by Jonathan Chait), and Paul Van de Water, and a follow up by Chuck and Jim Capretta. Why does this dispute exist? It can’t just be politics. If it were, we’d have double-counting disputes about every program. But we don’t. We thus need an explanation for why this debate has erupted around Medicare Part A, which provides hospital insurance, but not around other programs. 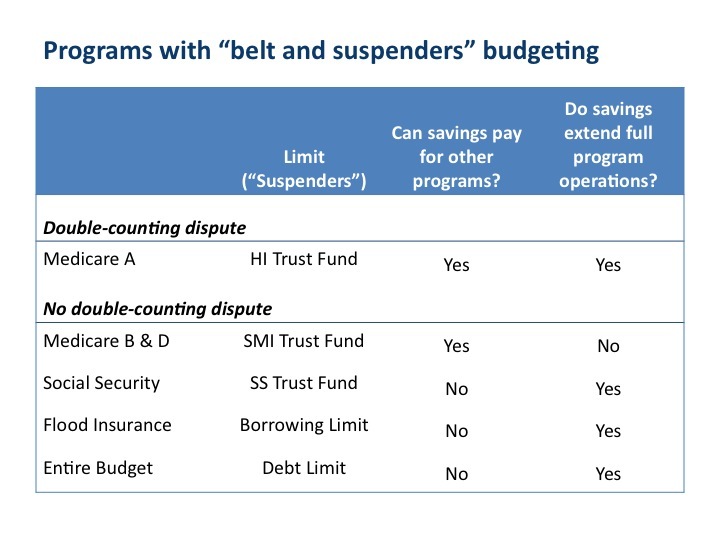 Part A is not unique in controlling spending by a “belt and suspenders” combination of regular program rules (the “belt”) and an overall limit (the “suspenders”). Such budgeting also applies to Social Security, Medicare Parts B and D (which cover physician visits and prescription drugs), and the National Flood Insurance Program. The federal debt limit acts as “suspenders” for the entire budget. But none of those give rise to double-counting disputes. That suggests that there is something unusual—perhaps flawed—about budgeting for Medicare Part A. To see what that is, it helps to boil the dispute down to two basic questions about programs subject to “belt and suspenders” budgeting. First, can spending reductions or revenue increases in the program offset spending increases or revenue reductions in other programs? In short, can budget savings pay for other programs? Or must they stay within the program itself? Second, would hitting the overall budget limit affect program operations? In other words, do budget savings extend the period during which the program can operate at full capacity? Or is the limit operationally toothless? As shown above, policymakers have answered these questions differently for different programs (for further details, see the appendix). This comparison reveals the unique feature of Medicare Part A: It is the only one of these programs that allows budget savings to pay for other programs and has a trust fund with real operational teeth. It alone answers Yes to both questions. That is why Medicare Part A is the only program that creates the possibility of double counting and suffers from the reality of a double-counting dispute. Double counting isn’t possible in Social Security or the NFIP because budget rules require that savings stay in the program. It isn’t possible for the budget as a whole since there are, by definition, no other programs to fund. And double counting isn’t possible in Medicare Parts B and D because its trust fund does nothing to limit operations. But double counting is possible in Medicare Part A. That happens whenever someone claims that the health reform legislation both reduces deficits and provides additional resources to Medicare Part A. I will leave it to others to adjudicate whether any health reform proponents committed that error. I will note, however, that every budget expert, including Chuck Blahous, agrees that CBO didn’t do so (its baseline ignores the trust fund, so savings reduce deficits and have no effect on program operations). Bottom line: The peculiar budget rules for Medicare Part A make it possible for analysts, pundits, and policymakers—whether willfully or inadvertently—to double count budget savings in Medicare Part A. That needless confusion is a significant flaw. To correct it, Congress could adopt the budget practices it uses in Social Security, Medicare B & D, or the NFIP. In a follow-up post, I will examine the pros and cons of these alternatives. High-deductible plans are gaining market share. Here’s another important fact from the Kaiser Family Foundation’s recent survey of the employer health insurance market. As shown in the chart above, health insurance plans with high deductibles and a saving option (HDHP/SO) have been gaining market share rapidly. 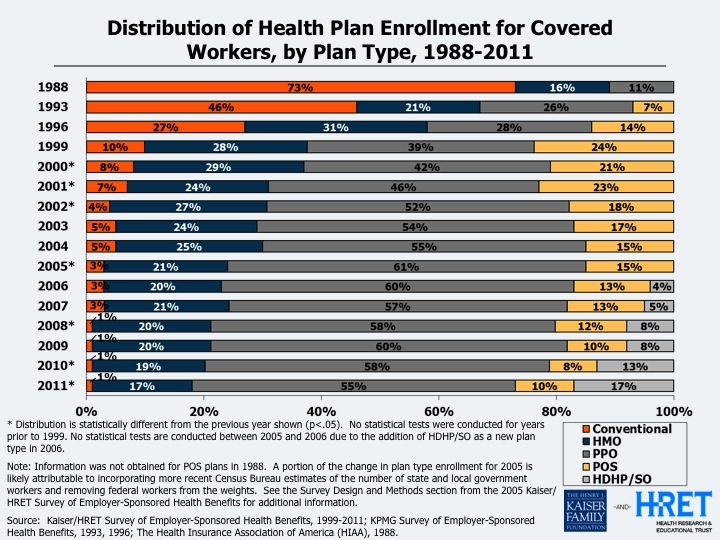 Only 1-in-25 enrollees were in such plans in 2006; today that figure is more than 1-in-6. The increased popularity of these plans–which involve Health Savings Accounts (HSAs, created by the 2003 tax law) or Health Reimbursement Arrangements (HRAs)–has come at the expense of health maintenance organizations (HMOs, down from 21% in 2005 to 17% in 2011), preferred provider organizations (PPOs, down from 61% to 55%), and point-of-service plans (POS, an unfortunate acronym, down from 15% to 10%). When paired with HDHPs, HSAs and HRAs are often called consumer-driven health plans because they give the patient / consumer more direct responsibility for health spending. 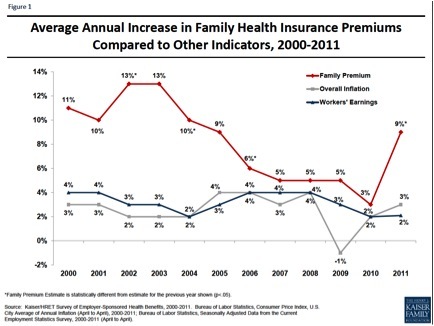 In return for lower premiums, beneficiaries face higher cost-sharing. To help cover those out-of-pocket costs, beneficiaries make contributions to tax-advantaged saving accounts. Bottom line: The employer market is moving toward more consumer-driven plans. Big question: Will translate into lower health spending? Why Does It Cost $230 Billion to Repeal Health Reform? Last spring, the Congressional Budget Office estimated that the new health legislation would reduce the deficit by $143 billion over ten years. Yesterday, CBO estimated that repealing that legislation would increase the deficit by $230 billion over ten years. What gives? Why would it cost $87 billion more to repeal the law than was saved by enacting it? The main reason is that the 10-year budget window moved. The health debate started in 2009, so CBO used a 10-year window that ran from 2010 to 2019. It’s now 2011, so the repeal law will be judged against a 10-year window that runs from 2012 to 2021. The $230 billion figure reflects that longer window. Through 2019, the cost would be $145 billion. The second reason is that the legislation President Obama signed last spring wasn’t the final word on health reform. In December, Congress was struggling to find a way to pay for the infamous Medicare “doc fix”, which now runs through the end of 2011. To do so, Congress decided to cut $15 billion from the subsidies created by the health legislation. Because those cuts reduced future subsidies, it is now $15 billion more expensive to repeal the overall health reform. The third reason is that the original health legislation wasn’t just about health policy. It also included fundamental reforms to the way the government subsidizes college loans. The repeal bill wouldn’t undo those changes, which resulted in budget savings of $19 billion over 2010 to 2019. Finally, the original health reform included about $7 billion in net budget costs during 2010 and 2011. It’s unlikely (to say the least) that the health repeal bill would be enacted in time to avoid those costs. Bottom line: CBO estimated that the original legislation would reduce deficits by $143 billion over 2010-2019. CBO now estimates that repeal would increase deficits by $145 billion over the same period; the slight difference reflects the education provisions in the original legislation, the 2010 and 2011 costs that can’t be avoided, and the December 2010 changes to the law. The jump from $145 billion to $230 billion then reflects the addition of two years to the budget window. P.S. The $230 billion figure is preliminary and subject to change once CBO has an opportunity to update its calculations to reflect the latest information about the economy, health care markets, etc. P.P.S. Aficionados of the health debate will recall that many differences of interpretation surround CBO’s cost estimates for health reform. You can see some of my discussion here.